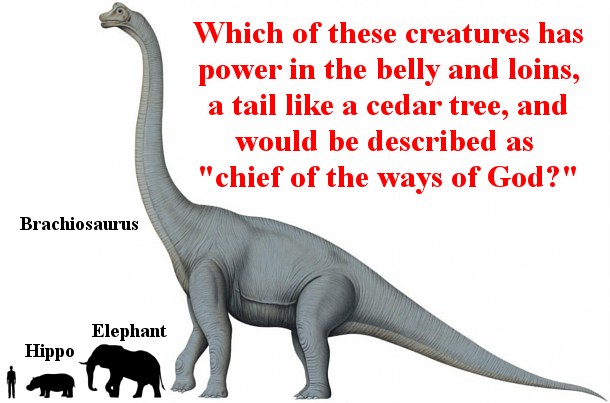 With Dinosaur bones being so prevalent in the fossil record and so massive, why are they unmentioned in the Bible? After all God did say He created all animals on the 6th day as well as man. We see animals mentioned quite often and man mentioned constantly, but yet dinosaurs don't seem to appear anywhere in the Biblical narrative. Actually this is incorrect. Animals are not mentioned often at all. Rather we find animals named specifically in only 1 or 2 books of the Bible. The largest mention of animals is in the latter part of the book of Job, where God details a multitude of animals and their characteristics and abilities. Among them and usually glossed over is behemoth and leviathan. 15 Behold now behemoth,WHICH I MADE WITH THEE; he eateth grass as an ox. The Behemoth is obviously quite large and an herbivore. Based on these descriptions the behemoth lives in the rivers of the Jordan and acts very much like a water buffalo but requires several times the amount of food. 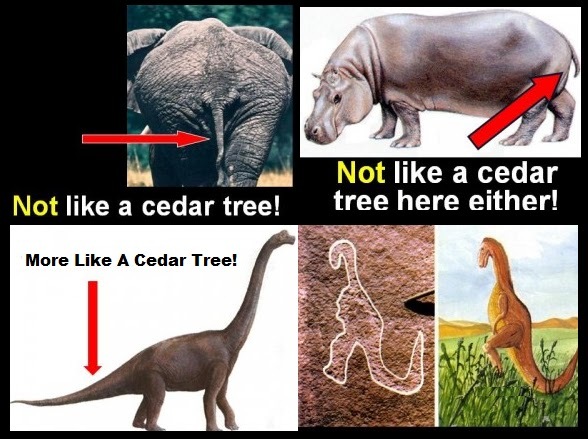 It is not an elephant either as an elephant can be easily killed by humans and does no have "a tail like a cedar". Proof that Mammals & Dinosaurs COEXISTED!! 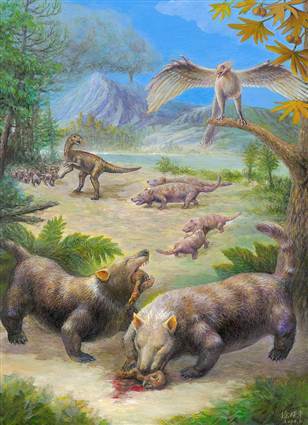 According to evolution, mammals only evolved beyond mouse-size AFTER dinosaurs went extinct. 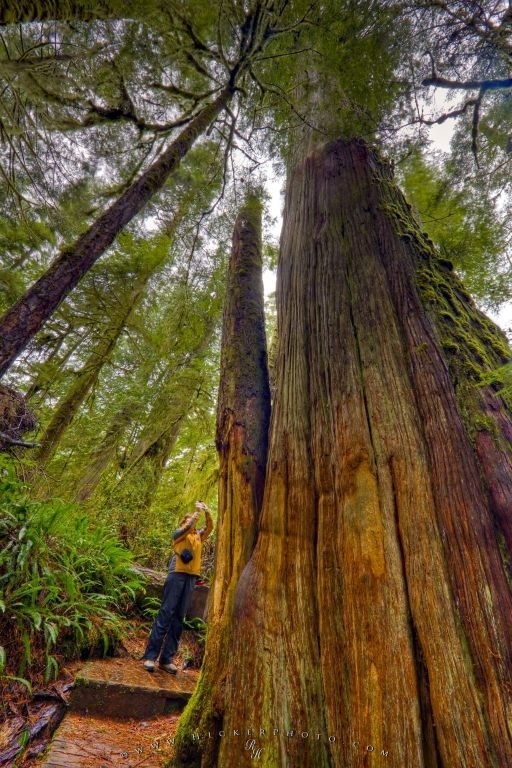 The large mammals didn't evolve until millions of years AFTER the dinosaurs. Therefore large mammals are said to never have coexisted with dinosaurs, as they came AFTER dinosaurs went extinct. ​However recent fossil finds have put even this theory of evolution to shame. Large Mammals not only existed at the same time as dinosaurs but even have DINED on dinosaurs BEFORE they went extinct. This was found in China. If evolution didn't get this timeline right, what else did they get wrong? Shouldn't we believe the Bible that says dinosaurs were created at the same time mammals, like humans were? After all the scientific evidence proves it. ​Even though the term dinosaur, meaning terrible, powerful, wonderous lizards, was coined in 1842 by Richard Owen using the Greek word deinos, the Bible proves itself not only up to date but ahead of its time. Instead of a nebulous mention of these massive creatures that most would expect, we find the Bible delve into exquisite details about these dinosaurs and their characteristics. 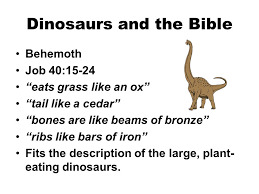 In fact the Bible goes out on the limb to say man coexisted with dinosaurs, that has been proven by the fossilized tracks of human and dinosaurs found in Texas. This again proves the Bible is of divine origin, as it even possesses only recently discovered facts are in complete agreement with the Bible. Knowing that the Bible is proven accurate by even its information on dinosaurs, we know its reliable when it says we are all born in sin and can not do enough good in our lifetime to even out our bad. This means we need a saviour and God has already provided one for us, Jesus who is called the Christ some 2000 years ago. He died for the penalty of our sins which is death and rose again 3 days later to prove He alone was God. The Bible says if you simply believe in your heart and confess with your mouth that Jesus is Lord and died and rose from the dead, that you would be saved from the wrath of God on all sins. Won't you do that today?